Once again highlighting the rampant misuse of the Armed Forces (Special Powers) Act or AFSPA, a Supreme Court-appointed Judicial Commission has noted that the Act has failed to tackle insurgency and that the armed forces were indulging in gross violation of human rights by operating under the shield of the controversial law. Noting that the use of the AFSPA was being done by making mockery of law, the Commission has noted that there was gross abuse of the Act and encounters being carried out in the North-eastern State were not genuine. “It would appear that the security forces believed a priori that the suspects involved in the encounters had to be eliminated and the forces acted accordingly,” the report added. The Commission, which was headed by former judge Santosh Hegde with former Chief Election Commission J.M. Lyngdoh and retired IPS officer A.K. Singh as its members, was formed by the apex court to investigate alleged cases of extra judicial killings in Manipur. In September last year, the Extrajudicial Execution Victim Families’ Association (EEVFAM)) along with Human Rights Alert (HRA) submitted a list of 1,528 cases of killings in Manipur since 1979 before the Supreme Court and demanded investigation into the deaths. In its 100-page report, the Commission pointed out that the six sample cases of encounters it investigated, it found that they were “not genuine” and that “maximum force” was used to kill people. “Though the Act gives sweeping powers to security forces even to extend of killing a suspect with protection against prosecution, it does not provide any protection to the citizens against its possible misuse…Normally, the greater the power, the greater the restraint and stricter the mechanism to prevent its misuse or abuse. 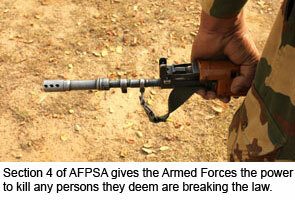 But in case of the AFSPA in Manipur this principle appears to have been reversed,” the report added. “We notice that impunity for systematic or isolated sexual violence in the process of Internal Security duties is being legitimised by the AFSPA, which is in force in large parts of our country. It must be recognised that women in conflict areas are entitled to all the security and dignity that is afforded to citizens in any other part of our country,” the report said.